Many people don’t bake bread in their own kitchen. But they will definitely start once they realize how simple it is with a bread loaf pan. Features and capabilities are one of the most important factors to keep in mind when looking for bread pan. You can make white sandwich bread, fresh banana bread, French bread, or raisin bread. You can also use it for pot pies and meat loaves. What is Bread Loaf Pan? 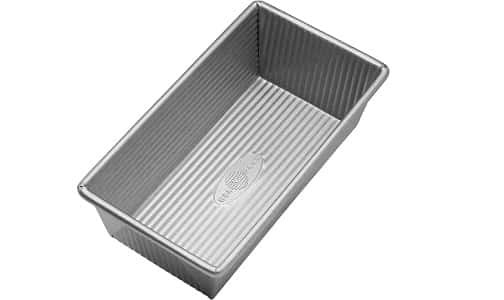 As the name suggests, bread loaf pan is a container used for baking bread. It is used to keep your bread in shape while baking. It is made of different materials. You can always get the best of loaf pan. A quality loaf pan can easily make your job done with ease and it should be non-stick. You may just use them and clean them just like other utensils after work. You will want to consider various things when looking for the best loaf pan to narrow down your choices. 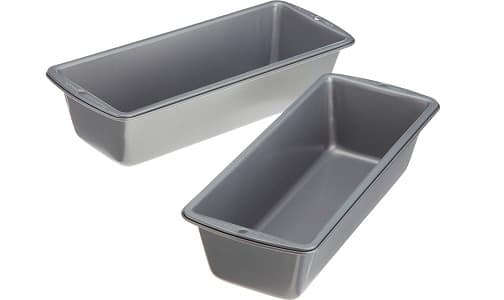 Aluminum – It is the most common material used in manufacturing bread pans. It provides great results and is very affordable. It is the good conductor of heat as compared to other materials. So, you can evenly brown your bread and cook evenly. You can easily remove bread from the pan due to its non-stick coating but it is more prone to scratches than unfinished pans. Aluminum pans don’t last longer so you will want to replace them. 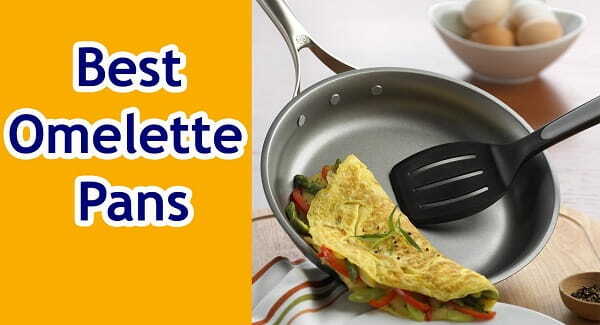 Stainless Steel – Stainless steel pans may not heat evenly and can cause issues. It is very simple to cleanup and it also resists scratches. As compared to other pans, stainless steel is very expensive. But it is worth because they last longer. Glass – They are not much popular. It can cook outside of the bread faster but leaves inside uncooked in the middle. But glass is not that easy to handle. It is prone to chip, crack, and even shatter due to heat reaction. Silicone – These are known to be the latest invention but they gained popularity because they cool down very quickly and they don’t dent, scratch, or oxidize. Silicone pans look whether it is first or 100th These pans are microwave, freezer, and oven safe up to 450F. They are also dishwasher safe. Ceramic/Stoneware – Like glass pans, ceramic or stoneware pans are also prone to chipping and cracking. They are supposed to be the best choice for even cooking. You can cook the bread inside when browning outside at the right temperature. You may want to use it more to make it cook more evenly and become more nonstick over time. A seasoned stoneware or ceramic pan can last for years. Be sure the bread pan comes with good warranty. Keep the replacement parts with care. Warranty varies according to the brand. You may want to find the longest warranty. But don’t base your decision only on this factor. You can find bread pans in different sizes. You need to consider the right size for your needs. Most of your decision is based on the recipe you want to bake. Here are the common bread recipes and the right size of pan for them. For yeast recipe which requires up to 3 cups of flour, you will need 8.5”x4.5” of bread pan. If you need 3.5 cups of flour for your recipe and it may be all-purpose flour or bread flour, you need a bread pan which is a bit larger. You can bake in standard bread pan if you use whole wheat. Look for larger pan for combination bread. For making single loaf which needs up to 3 ¾ cups of whole-grain, white, or combination flour, you need 9”x5” pan. Some bread recipes need at least 4 cups of flour. You will want to bake these recipes in a pan which is 9”x5” or larger. Bake half the recipe if you have 9”x5” pan or use two pans of this size. It measures 8.5 x 4.5 x 2.75 inches so you can easily bake flawless bread, pound cake, classic meatloaf, and moist cornbread. You can bake quality artisan beads which are finished well with great flaky crust. This loaf pan is a very versatile accessory for your kitchen and you can use it for everything, such as delightful chicken pot pies and no-crust quiches. 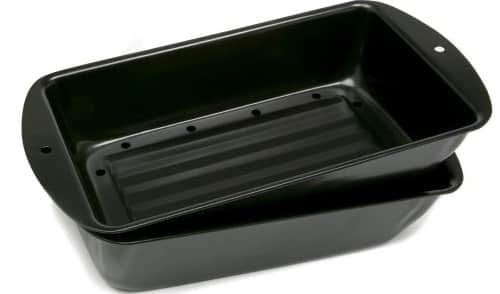 Designed with AMERICOT Plus non-stick coating, this loaf pan is very easy to remove baked items and cleanup. It is also PFOA, PTFE, and BPA Free material. It has been made in USA according to high performance standards with heavy gauge steel and aluminized construction for great service life and even heat distribution. It also has steel wire in rim for great strength and it also resists warping. The fluted design improves air circulation and pan strength to bake breads like a pro. Be it bake ware, cookware, dinnerware kitchen tools, kettles, or cutlery, Rachael Ray is a household name in kitchenware collections of best quality, so you can prepare meals in a unique style from start to finish. Add rich flavor and hues to every dish in your kitchen with this Oven Lovin’ Deep Rectangle Pan. Bake loafs or banana bread like a pro with this versatile pan. This loaf pan includes delicious Mile-High Lasagna recipe by Rachael. It has dishwasher safe, non-stick exterior and interior for easy cleanup. The handles are wide enough to provide great grip and cozy silicone grips to add grace to your décor. In order to produce well-grained, perfect breads for French toast and sandwiches, USA Pan Bakeware Pullman Loaf Aluminized Steel pan is the best bet. The AMERICOAT Plus non-stick silicone coating is the best choice for smooth bread release. It is made of PTFE, BPA and PFOA free material. To ensure even baking, it has sliding lid cover to create flat topped bread. It promotes even heat distribution with heavy gauge and aluminized steel built and it lasts for decades with care. 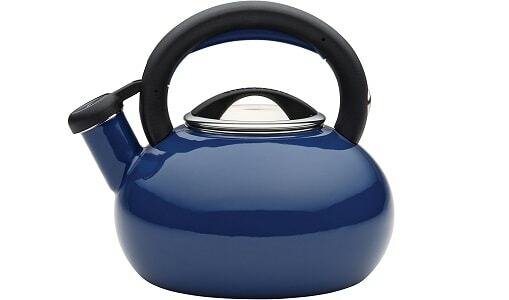 It is made with fluted surface for proper pan strength and air circulation to avoid warping. The rim has steel wire for added strength and it helps avoid warping. The bakeware is durable, reliable, and long-lasting. It comes with lifetime warranty and is made of 65% recycled steel. Since 1929, Wilton Enterprises is the top food crafting enterprise which offers the most innovative and complete range of decorating and baking supplies for making cookies and candies. This loaf pan set from Wilton Recipe is the best choice to bake homemade breads. You can effortlessly create your favorite recipe with this set of two loaf pans. It is made of heavy-gauge material for even heat distribution. It is preferred by bakers for well-browned recipes. It is easy to clean up and makes even food release. This pan is very easy to cleanup and bake homemade bread just like a bakery. Your family will definitely want more with it. This bread pan is made of cast iron for even heat performance and to get golden brown crust over the bread. For added convenience, it has handles. This bread pan is pre-seasoned with True Seasoned Finish by Camp Chef for natural cooking which is ready to use. Silicone has been the first choice for many years in making bakeware because it is both long-lasting and durable. This beautiful red bread pan is made of Latex and BPA free 100% food grade silicone. The pan is very easy to clean and use and is safe for family as it is designed as per LFGB and FDA standards. 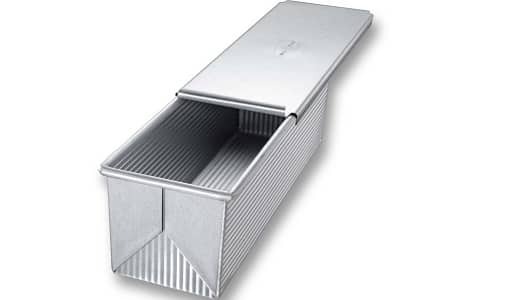 It is a multipurpose bread pan used to bake meatloaf, breads, lasagna and other recipes. It is microwave, freezer and oven safe up to 450F. In this set, each bread pan measures 10 ¾”x5”x2 ½”. Bread gets the perfect shape in these silicone pans, with softer crust than bakery-made breads. This bread pan stands up to produce tasty breads and other foods over time. It is both easy to clean and dishwasher safe and can last longer with care. 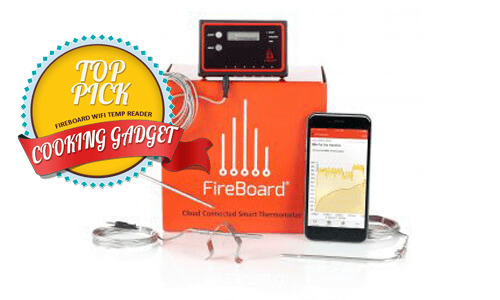 They have 100% customer satisfaction rating and include free extended warranty. Used for different purposes like bread, lasagna, meatloaf etc. Dishwasher safe, microwave and oven safe up to 450F. For baking pound cake and bread, the outer pan is large enough as it measures 11”x5.75”x2.5” and inner pan measures 9”x5”x2.5” with unique design. 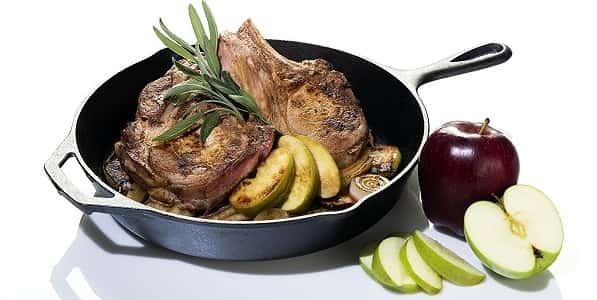 Calories and cholesterol in fat can easily drain out of the bottom pan. You can enjoy fat-free or non-oily meat loaf in your kitchen. The pans are easy to cleanup. The heavy duty build makes it even for heating. 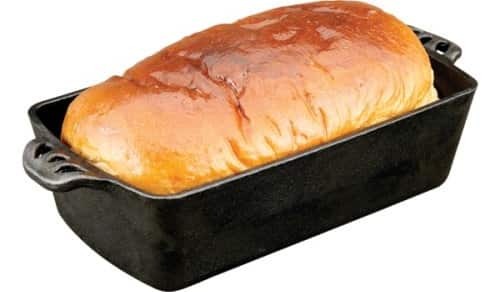 If you are first time user of a bread loaf pans then this article is for you as we have listed the instructions for using and cleaning the bread loaf pan. Here are more details. During every use, clean and dry the bread loaf plan before you even start using. Once the bread dough is ready, you can simply pour in the bread dough but ensure that you do not fill up the bread loaf pan till the top. Usually, there is no greasing required but if you feel that the bread might stick to the bread loaf pan then you can use fat paper or a little fat in the pan. Ideally, while baking bread, it is advisable to use olive oil or sunflower oil to grease the pan. Ensure that you grease the pan on all sides and you do it evenly. Cleaning the bread loaf pan is quite easy. All you need to do is that you need to use a damp cloth to wipe off the residue. If there are deposits on the pan then simply soak the pan in hot water for a couple of hours and then remove the deposits with help of a plastic brush. After that, rinse the pan and dry it properly before you store the pan. After every use, it is mandatory for you to wash the pan. If the breadcrumbs are sticking to the pan then you must soak the pan in hot water for some time. However, never use abrasive pads, steel wool or sharp object to remove the deposits from the pan. This will damage the non-stick coating of your bread loaf pan. Also, while storing the pan, you should never stack the pans one in another. If you really want to stack them together then you must put cloth or paper between the pans. This was all about using, cleaning and taking care of bread loaf pans. The life of your pan will increase significantly and you will be able to relish amazing home baked bread. Quality bread pans are all you need to bake healthy bread. To avoid sticking and other issues which can ruin the quality of food, it is always advised to use the top rated bread pans listed above. These pans are made of quality products. In our buyer’s guide, we have included all the information you need to pick the right bread pan. 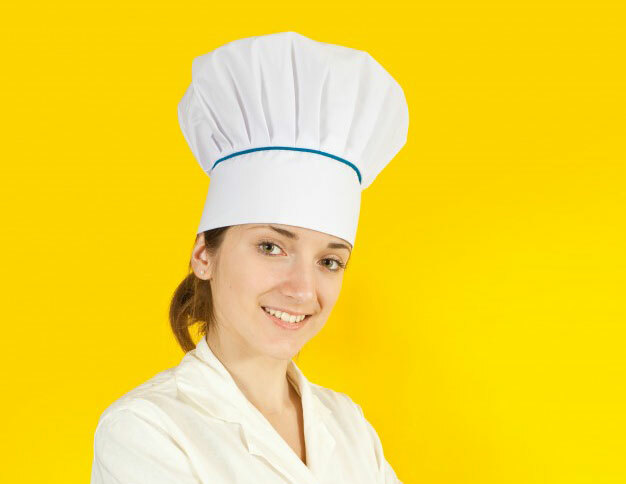 You can confidently make right decision with all the knowledge you need about the bread pans to make well-baked and delicious breads.